How do you drain a wet play area? Install area drains or a French drain. Areas that do not drain properly may require the installation of underground pipes to route water away. Area drains for small drainage areas (less than 400 sf) can be purchased at the local hardware store and are relatively easy to install. Trenches must be excavated so pipes laid in them will drain water to a low point where it is acceptable to release the water. To use area drains, the ground must be shaped so that water flows to the drain inlet. A French drain is a trench with a perforated hollow pipe along the bottom to redirect water that seeps down through an upper layer of gravel or rock. French drains are useful in areas with flat ground surfaces. Vegetated swales are drainage ditches laid out with interesting curves and patterns filled with river stone and vegetation. Typically, they are at least 3′ wide and 6″ deep. Use smooth river stones (large enough to that children cannot carry them away) to help slow the speed of the water and protect the soil from eroding. Shaping a vegetated swale with sinuous, gentle curves provides a longer swale length to assist in slowing down the water. Swales should be graded to drop a minimum of one foot in elevation for every 50 feet in distance (2% slope). It is important to install landscape fabric under the stones to ensure that soil does not erode and minimize maintenance. Plants can also be inserted through the landscape fabric to add interest to the aesthetic of the stone. Plant wet areas with native wetland or bog plants. Problem wet areas can be converted into mini-wetlands or bog gardens by using native wetland plants. Bog gardens or rain gardens are effective ways to create a landscape that tolerates excessive moisture. A proper bog has very specific soil media and depth requirements, but an area that is simply a wet spot in the landscape can still support a diversity of plant species. 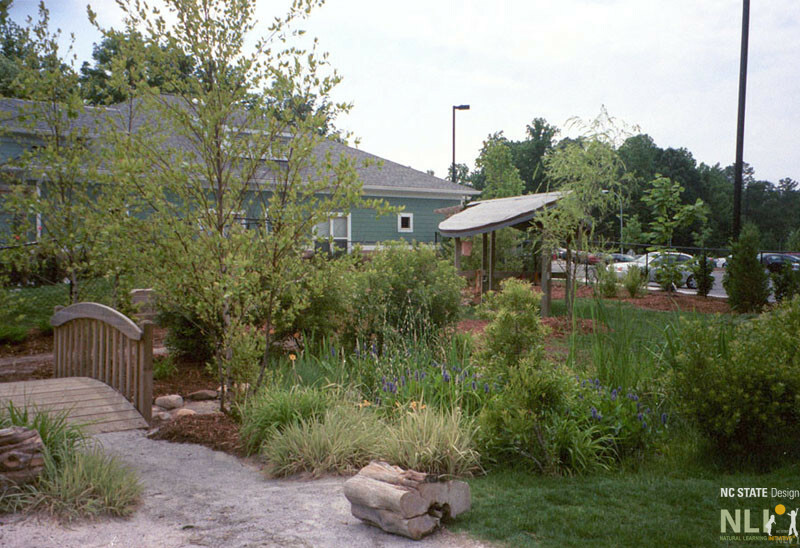 Connect the bog garden with a vegetated swale to create a “green” drainage system. Create meandering paths with materials that rise above the wet, muddy areas. If the wet muddy area is relatively unused, then use flagstones, tree cookies or decking to create a path to allow children to move through the area without getting wet. To avoid creating obstacles for lawn mowers, remove the grass around the path and use steppable plants around the stepping elements (flagstones, etc.). MYTH: Water hungry plants such as willow dry out wet areas. Not true! Plants do absorb water, but not enough to dry out soil quickly enough to make it usable. Thanks to Juliet Robertson, outdoor learning consultant, North East, Scotland, UK, for submitting this question. Her blog, I’m a teacher, get me OUTSIDE here!, is very informative and insightful.